A large cardboard box can be rescued in a myriad of ways. Making a dollhouse from a leftover box is a perfect way to use it again. This is a guide about making cardboard box dollhouses . I have made a doll's house out of small cardboard boxes (not shoe boxes, but a little bit bigger). I have done each room separately so I have 4 separate boxes. Would anyone know what would be a good covering for this when joined together to make it more sturdy? I want to use something other than wood. Many thanks. I would use foam core board. Then you can use contact paper to decorate the outside if you so choose. Many dollar stores have inexpensive peel and stick tiles. How about those in different patterns for roof and sides, doors and window frames could be yet another pattern. 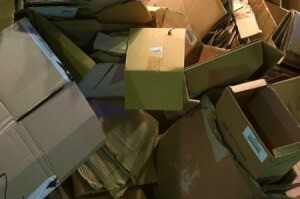 Corrugated cardboard can be really strong depending on what it is made to hold. Go to your home appliance store (washers, stoves) or stores that carry heavy goods and see if you can get discarded cardboard. Hold the individual boxes together with a strong glue and then wrap with the strong cardboard. A hardware store could tell you the right kind of glue or strapping to hod the dollhouse together. Good luck. Send ThriftyFun a picture when it is finished if you can. I would suggest contact paper. Modge Podge may also work, but test it first, as it may bubble or warp as it dries. Caution craft or any other type medium of paint will warp it as it dries.